This blog post was crossposted from the USAID IMPACT Blog. From November 25th (International End Violence Against Women Day) through December 10th (International Human Rights Day), USAID joins the international community for 16 Days of Activism Against Gender Violence. During this time the IMPACT Blog will highlight USAID’s work to combat gender-based violence. Farmer Field Schools, where men and women smallholder farmers teach each other about appropriate farming techniques, are a common and long-standing approach to improving their production. 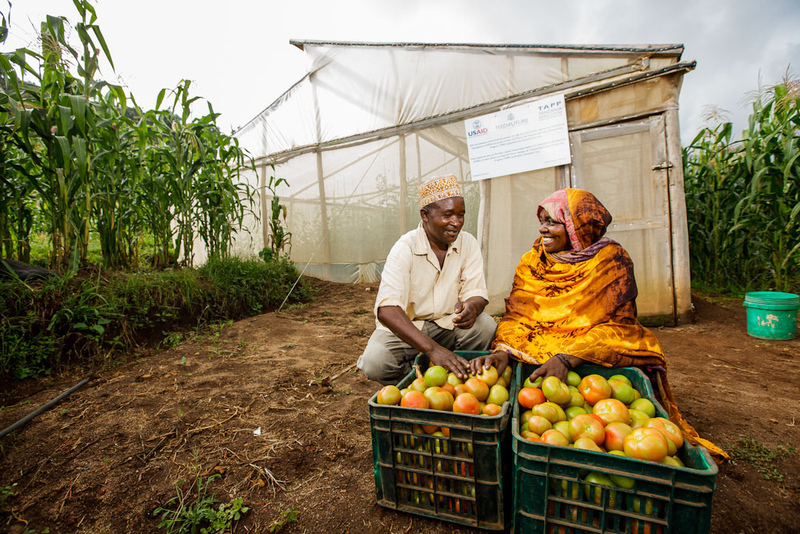 In Bunda District in Western Tanzania, a USAID partner, Canadian Physicians for Aid and Relief (CPAR), is finding that Farmer Field Schools can be a forum for men and women to discuss sensitive issues such as gender-based violence. Kizom Farm Field School (FFS) group member Saada cultivated cotton this year with her children. She sold the cotton for Tsh 400,000 (about $266) and planned to use the money to start a ‘mgahawa’ (tea shop) in the centre of the village as an additional source of income. Before she could proceed with her plans, her husband Amos seized the money. Having discussed human rights in her FFS group and being fully aware of her basic human rights, Saada stood up to her husband and demanded that he return the money. He then beat her. She reported the incident to her FFS group. As a result, a delegation of the FFS group leadership visited the husband. Amos claimed that women in this society have no right to own money so the delegation, including his wife, spoke to him at length about equal rights for all of society and the fact that Saada has every right to hold and control cash, and most certainly the cash she earned from the cotton. Furthermore they told him that Saada has the right at all times to be treated with respect and live free from violence. Amos apologized to the FFS delegation and to Saada, and said that he would not beat or take money from her again. The money was already gone – spent on other women, Saada figures — but their relationship is now on a new footing. Saada has further stressed to her husband that she has the right to equal ownership of everything in the household. Amos will now be held to greater accountability for his actions. Not only is Saada fully aware of her rights, she has her whole FFS group of women and men ready to back her up – and has served as an inspiration to members of her community. CPAR’s experience with Farmer Field Schools demonstrates the importance of providing an opportunity to discuss topics such as gender-based violence, even when it is not directly related to the group’s original purpose. Having a place for women and men to talk and learn together, in this experience, created an environment of support for human rights and freedom from violence.